CANCELLED DUE TO SUCCESSFUL ERADICATION: THERE’S NOT ENOUGH KNOTWEED LEFT TO PULL THIS SPRING! Japanese knotweed is a robust weed, native to Eurasia, that has invaded riverside forests on Oregon’s North Coast. It was widely planted in logging camps and along headwater streams in the 1900s. Floods transported root masses downstream, creating huge infestations on many Oregon rivers, including the Necanicum. 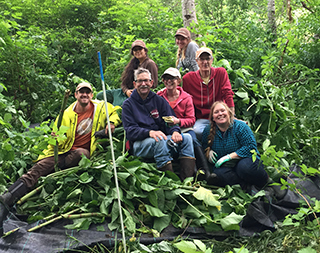 NCLC has been working to rid Necanicum Forest Habitat Reserve of knotweed for several years. One more big assault by volunteers will help us get a handle on this invader. We’ll provide all the tools needed. Please e-mail Stewardship Director Melissa Reich at melissar@nclctrust.org or call her at 503-738-9126 if you plan to attend; she will provide directions to the site and additional details. Wear gloves and work boots. NCLC will supply the necessary tools. Bring water and snacks/lunch; there is no potable water at the site, and no toilets. Dogs are not allowed on any NCLC properties. Interested in controlling knotweed on your own property? It needs to be done carefully to avoid further spreading this robust weed. Click for guidance from The Nature Conservancy.